A group of billionaires and former NASA scientists is now unveiling the first asteroid mining company in history. They claim they will "add trillions of dollars to the global GDP" and "help ensure humanity's prosperity" by mining asteroids for rare metals like gold and platinum. Their objective is to "harness resources from passing-by asteroids". And they claim they are going to launch their first space prospecting ships within 24 months! 1:32PM: The presentation at the Seattle's Museum of Flight has just started. They just presented Charles Simonyi, Planetary Resources, Investor; Eric Anderson, Co-Founder & Co-Chairman, Planetary Resources; Peter H. Diamandis, M.D., Co-Founder & Co-Chairman, Planetary Resources; Chris Lewicki, President & Chief Engineer, Planetary Resources; Tom Jones, Ph.D., Planetary Scientist, Veteran NASA Astronaut & Planetary Resources, Inc. Advisor. 1:36PM: They are playing a video now presenting the new company. Their objective is to "harness resources from passing-by asteroids". Tom Jones, the astronaut and Planetary Resources advisor, is talking in the video about how asteroids passing near Earth contain these materials. 1:43PM: Peter H. Diamandis, Co-Founder & Co-Chairman of Planetary Resources and the author of Abundance: The Future Is Better Than You Think, is talking now. He's making the point that the real engine of exploration has been the search for resources. The Europeans got to America in search for spices, and later gold and other natural resources. Now it's going to be the same for space. 1. Advanced robotics that will allow for small spacecraft that can do a lot of things on their own. 2. New launch platforms, like SpaceX's Heavy Falcon rockets. 3. Investors with no fear of risk, like Google's Page and Brin. He actually means space nerds with gazillions of dollars. 1:49PM: Of course, Diamandis is now saying that what they are planning is totally doable. That is going to be extremely difficult, but it will work and it will bring the resources we need with a huge return of investment. 7:51PM: Diamandis has introduced Eric Anderson, who's the founder of Space Adventures, the company that brought a lot of millionaires to space. He believes that this industry is going to be huge and that they are only the first company and soon other will follow. 1:53PM: Anderson is going to tackle the economics of this plan. First, what's the value of asteroids. The company doesn't care about the asteroid belt. They just care about near-Earth asteroids. There are 9,000 known Near Earth Asteroids. He argues that there are 1,500 that are energetically as easy to reach as the Moon. One of the main resources they are going to mine is water. This will be used for fuel—oxygen and hydrogen—for space missions to Mars and other points of the solar system. Obviously, they are thinking long term here. He argues that, by mining this fuel on near-Earth asteroids, the cost of space travel will be peanuts. The second resource is precious metals. He says they want to make precious elements abundant. Just like aluminum was a rare metal at the beginning and now it's one of the core building metals in the world, they want to do the same with platinum, gold and other rare elements. This will allow for technology never seen before. 1:59PM Wow, they are going to be launching their first line of mining spacecraft in 24 months! Holy spaceballs. These are not going to be extractors, but explorers. They are also going to launch prospectors to space, specialized telescopes that will explore near-Earth asteroids. They will use these prospectors to study and understand the Asteroids. See how big they are, their spin rate, their speed... and then analyze their components, launching swarms of mining explorers. Once they realize what are the asteroids they want to use, they will launch the extractors. He hasn't mentioned when are these are going to launch. Probably this is still quite far away. 2:07PM He says that they may fail, but that they believe they are going to make it. To back this he has presented the investors, including the founders of Google and Perot Jr. Man, this guy is really enthusiastic. I bet he can launch space mining robots with his bare hands. 2:10PM Chris Lewicki, who was at NASA involved with the Mars' rover exploration programs. "Hello, my name is Chris Lewicki, and I'm a space miner" he says. 2:11PM He believes that they are going to be able to make these space mining robots for single-digit million of dollars. He also claims that their missions will be in the two-digit million numbers. This is a pretty bold statement. These numbers are just a tiny fraction of current space programs. He's talking about how they are going to achieve these low price tags: basically using high-speed, high-risk development of spacecraft. 2:18PM First they are going to use low-cost prospectors, called the Arkyd-100 Series. They have these now already. They will be set in low-earth orbit to locate the asteroids. As they work in cataloguing potential targets, they will be developing the Arkyd-300 series, which will form swarm of mining robots that will touch and study the Near Earth Asteroids. 2:22PM Tom Jones has taken the stage now. I hope he sings It's Not Unusual. 2:24PM Tom, who used to be a NASA astronaut and also studied near-Earth asteroids, is explaining how we are capable of reaching now: about 1,500 of them. Some of them will not even require actual mining, as they are groups of rubble loosely held together. He says that it's logical to imagine a machine that will grab this material to bring it back to Earth. Some of these asteroids are rich in water, and those could be used to establish space gas stations for solar system exploration. Machines would heat up the asteroid material so water evaporates and gets captured for its separation in hydrogen and oxygen. 2:31PM Tom believes that, unless we start harnessing these elements, we will not be able to keep a larger permanent presence in space. They are aiming at jumpstarting a whole new industry between Earth and the Moon. 2:35PM Ross Perot Jr. has joined the conference from Texas, who apart from being a businessman is also a big aerospace fan and the first guy to go around the world in an helicopter. He didn't say a lot of things, but his audio connection was bad. Or he was eating delicious BBQ. 2:38PM They have finished the presentation but the Q&A is starting now. If you have any questions beyond the obvious, tell me and I will ask. Write to jesus@gizmodo.com. Can you explain what you intend to do in two years time? They will be launching the first Arkyd 100 series spacecraft, a series of small telescopes/prospectors that will be networked together, flying in low-earth orbit. They will be using this to test technology for the Arkyd 200 series. They want to launch a lot of them, in an assembly line. Make them cheap, so they can launch them rapidly and don't worry about losing them. When are you going to be sending the swarms of spacecraft? They are not giving any final timelines. First they are going to be prospecting from low-earth orbit, then the Arkyd 200—which will have propulsors—will get nearer. Within a decade, they will launch the Arkyd 300 probes that will reach the asteroids that they want to use. What is going to produce the trillions of dollars? These will come over the next few decades, from both rare metal mining and from water as fuel in space. Are you going to sell the data you collect from the Arkyd network? They are going to be sharing the data. Are you going to be launching astronauts too or just robots? Only robots. 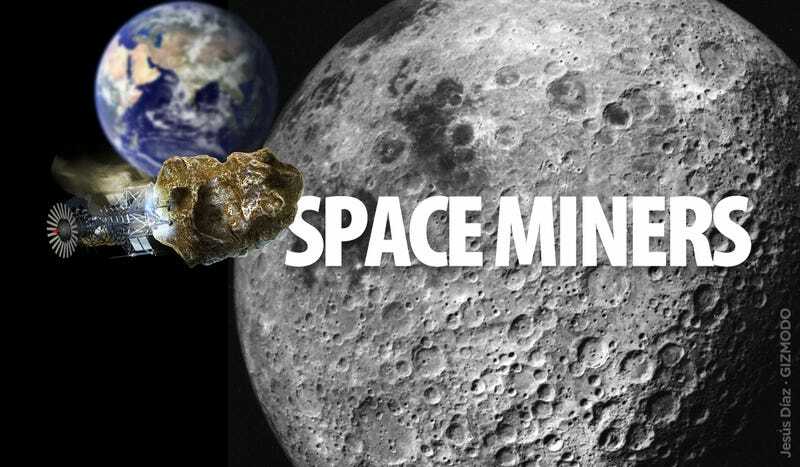 Eventually they may collaborate with NASA to work in manned missions, but not for mining. It will be too expensive to use humans. It's not good business. What's the math of these missions, the cost of launching and bringing it back? He will not go into the math, but he's arguing that a small asteroid—if you find the right kind—will pay for itself and give billions of dollars in benefits. He mentioned that a 50-meter-in-diameter asteroid with just 20% water represents the entire fuel spent on the shuttle program. Where are you building and from where are you launching? They are building the Arkyd probes in Bellevue, Seattle. They will be launching them alongside other satellites. Do you have any contracts with NASA or other companies? They one contract with NASA—working in optics—and other contracts companies and public agencies. They started work in 2009, apparently. Could you use the Arkyd 100 for Earth observation?